Kobe Bryant, AKA the Black Mamba, was a once in a lifetime basketball player. Sure, his athleticism and incredible shot-making ability played a huge role in his success. But more importantly, Bryant had fundamentals, tenacity, and work ethic. He was a no-holds-barred competitor who fought for everything he got on the court. In his younger years, his athleticism is what defined him. His ability to ferociously attack the hoop is what separated him from other players. At this point of his career, he had not yet developed a consistent jumper. He only shot 41.7 percent from the field his rookie year. However, this wasn’t necessary due to the other players around him. His most important teammate by and large was Shaquille O’Neal, AKA Shaq Daddy. Shaq is one of the most dominant big men in NBA history and he was the perfect complement to Bryant. O’Neal was an unmovable object down low and dominated the game unlike any other big man before him. He was the type of player who would dunk the ball and his opponent through the hoop at the same time. The combination of Kobe and Shaq controlling the paint was nearly unstoppable and led the Los Angeles Lakers to three NBA championships in a row from 2000-02. These were arguably the best teams in NBA history; the only thing that stopped them was the feud between the two stars off the court. The duo despised each other and this eventually led to the trade of Shaq to the Miami Heat in the 2004 offseason. After the trade the Lakers struggled to find their footing for a couple of years. The Lake Show actually missed the playoffs in the 2004-05 season despite Kobe putting up absolutely insane numbers. He averaged 27.6 points per game, six assists, and just under six rebounds that season. This all changed when Los Angeles traded for a 7-foot playmaker by the name of Pau Gasol. Gasol did not have the same physical presence as Shaq, but he was a very skilled player with an extremely high basketball IQ. The Lake Show acquired Gasol in the 2007-08 season. Kobe also developed a new signature move: a 15-foot turnaround jumper that became one of the most unstoppable moves in NBA history. The only other player to use this move with such beauty was Michael Jordan. This new shot made Kobe untouchable. Defenses now had to pick their poison: Do you double team him and risk leaving another shooter open, or do you let him make the same shot over and over again? NBA teams couldn’t figure out the answer and the Pau- and Kobe-led Lakers ended up winning two more championships in 2009 and 2010. The Black Mamba averaged about 26 points per game during these title runs. So, what’s the point, Nick? (I’m Nick.) Who cares? A lot of people know how Kobe used to play and how dominate he was. The point is that he completely changed his game to become one of the best shooting guards in NBA history. There are many young players who have come into the Association and dominated with overwhelming athleticism. Some of these players include Derrick Rose, Tracy McGrady, and Steve Francis. The difference between Kobe and these other players is his determination to become more than a one trick pony. When his athleticism started to wain, he found other ways to dominate the game. In fact, I don’t believe he actually became the Black Mamba until he developed his patented turnaround jumper. There is no denying that it is hard to stop a young athletic player, but it is possible. Defenders can force them to take outside shots, step in front for a charge, or foul them every time they come down the lane. But there was virtually no way to stop his 15-and-in game. Even when opposing coaches sent a double-team he would still make the shot most of the time. It was almost comical to watch defenders try and stop him because they knew exactly what was coming but still could do nothing about it. And even though he was for sure a ball-hog, he passed just enough to keep defenders on their toes and keep opposing coaches off balance. His patented 15-foot turnaround jumper is a move that every kid in the world can practice and duplicate. It may not look as good as his, but as long as the ball goes through the hoop, that’s all that matters. I mean I can even make this shot from time to time and I am by no means an athletic freak of nature. All it takes is hard work and a desire to master the fundamentals of basketball. In a day and age where every player in the gym fires up 40-foot three pointers like Stephen Curry or tries to dunk the ball like Giannis Antetokounmpo, it’s much more realistic and attainable to work on a 15-foot turnaround jumper. It may not be flashy, it may not be cool, but it is effective. And this move was used by arguably the best two shooting guards in NBA history. 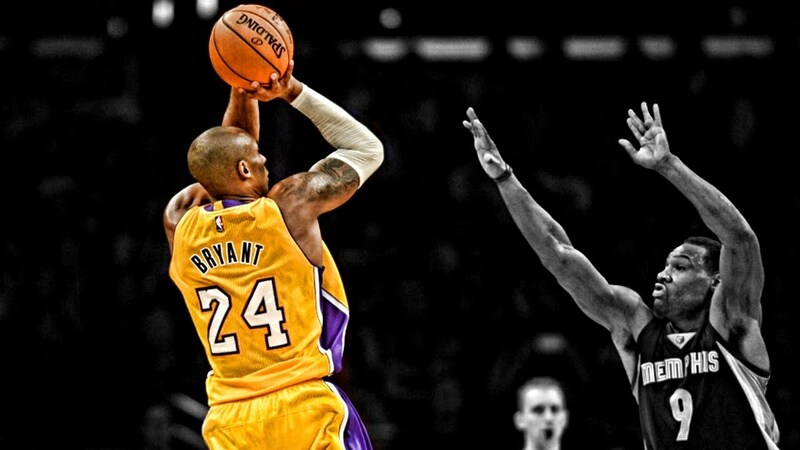 Kobe’s competitive fire and rings are often discussed, but it is his fundamentals that made him the Black Mamba.